Less than 10 hours left to help solve the tuition crisis while simultaneously reducing your tax base for 2012. Give to NNJKIDS to helps all of the local Yeshiva Day Schools or to AJE to help fund the "affordable" blended learning schools popping up all over. Or give directly to the schools. Hopefully they will use the funds to keep tuition from rising and not to fund a third teacher in each Kindergarten class. Fortunately they all have web pages making it very easy for anyone with a credit card to give. Word is, SAR is going to try a progressive tuition system where everyone making over $400K will be getting a tuition hike of 15% next year. Everyone making under that amount will be entitled to a reduction in the amount of the increase. This will allow them to avoid their typical 5% annual increase for the next several years. The $400K crowd might be able to afford the increase, though with the expected new taxes for their income bracket, if they have 4 kids in SAR & SAR High it still won't be that easy. But what bothers me more is making people in the 200K and 300K brackets go through the scholarship process, when they are in the top 2% of American earners. I image many of them are going to start looking at Westchester Torah Academy. I have no problem with multi-millionaires from Fieldston wanting a school with tons of bells & whistles (though I'm skeptical that any of them actually improve education). They earned their money & have a right to spend it however they want. They donate a lot of money & the clout they have from those donations force the school to focus on "academic excellence" rather than affordability. My problem is that until now there was no other option for everyone else who just wanted a normal yeshiva education for their children that they could afford. Personally, if I was a multi-millionaire from Fieldston I would be much more concerned about the future of Modern Orthodox Judaism in America than I would about maintaining the Blue Ribbon School Award of Excellence in my children's school. I would much rather donate to AJE than SAR. How awesome is it to have off from work when your kids have school? I hope the He'atid clones copy this policy. At the Affordable Jewish Education Project (AJE), we are proud to be partnering with three new yeshivas to aggressively embrace educational innovation with an eye towards affordability. Yeshivat He’Atid launched this past September in Bergen County with 116 students, and Tiferet Academy and Westchester Torah Academy will open in September 2013 in the Five Towns and Westchester, respectively. There have been concerns expressed about both the newness of our model and the effects new schools will have on existing yeshiva day schools. Given the havoc the tuition crisis is wreaking on our communities, however, we feel an urgent need for an immediate push to embrace innovations in the way we teach our children. While we would be honored to be able to take credit for these incredible educational innovations, the ideas that our schools are implementing are already the norm in many schools across the country; we are simply partnering with experts in the field to adapt those models to our schools. Over 40 states have virtual schools or online learning initiatives and a recent study estimated that "two thirds of districts are offering some online or blended program." The compound annual growth rate of pre-K through 12th grade online learning is 43 percent, and that number is growing every year. Some of the largest foundations focusing on U.S. education are already investing aggressively in blended learning initiatives in order to improve educational quality in both public and charter schools. The foremost goal of the Gates Foundation’s “Next Generation Learning Challenge” grants totaling $24 million is "increasing the use of blended learning models." The Dell Foundation, Hume Foundation, and Hewlett Foundation have also spent millions of dollars on similar initiatives. Why has blended learning been growing in popularity at such a rapid pace? Because studies are showing that it works. A 2009 meta-analysis by the U.S. Department of Education found that "in recent experimental and quasi-experimental studies contrasting blends of online and face-to-face instruction with conventional face-to-face classes, blended instruction has been more effective." Rocketship Education, which runs seven elementary charter schools servicing 2,500 students in Northern California and has been implementing blended learning since 2007, has shown very impressive results. Despite 90% of its students coming from poverty and starting out 2-3 grades behind, Rocketship's students outperform every elementary school in the area and are on par with their affluent peers in Palo Alto. In KIPP: Empower, a blended learning elementary school in Los Angeles that uses the same in-class rotation model being adopted by our new schools, 94% of students scored at or above the national average in math, with 54% scoring in the top quartile. Those results were even better in reading, with 76% of students scoring in the top quartile. We have the tools available to provide a personalized learning experience to our students in small groups by empowering our teachers with tools to track each student’s progress using real-time data. Why not take advantage of these amazing tools? In our schools differentiation is the rule, not the exception; each child experiences a truly individualized educational program. It is possible that in the short run, establishing new schools may negatively impact some existing day schools. On the other hand, we have never encountered any industry, for profit or non-profit, where the value to the consumer has been enhanced by limiting choice. Yeshiva day schools exist only to serve the community. They are a means, not an end. If they are structurally unable to meet the needs of the community in their current form, we need to have an outlet that does. Our current yeshiva day school network leaves the vast majority of families priced out of yeshiva tuition, or left with little remaining income for savings or for worthy charities. This has placed an unbelievable burden on young families. We strongly believe that providing a Jewish education to our children should require sacrifice, but a reasonable sacrifice. Our day schools all teach middot, derech eretz and chesed to our students, but the task becomes easier when the school itself sets an example that is sensitive to all families across all levels of income. It is our hope and expectation, however, that our new schools - and we are already starting to see this in the respective neighborhoods in which we are operating - will encourage existing schools to finally embrace innovation in ways they had been unwilling or unable to do so previously. We firmly believe that by adopting this model we can elevate educational quality and simultaneously reduce the cost per student of educating our children. We are not saying that all yeshiva day schools need to follow our exact model. What we are saying is that there should be at least one option for every student in every community to enjoy the benefits of a high-quality Jewish and secular education at a price that is affordable for the average family. Ultimately, a rising tide lifts all boats and we believe aggressive innovation could dramatically expand the pool of students attending Yeshiva day schools, thereby strengthening not only the new schools but the broader Yeshiva day school ecosystem. How Much Should Be Spent on Security? In the wake of the horrible tragedy in Connecticut there's been a lot of talk about making schools safer. I think some good suggestions that aren't crazy expensive include having every classroom door have a lock on it, having shades on all windows and the classroom door window, and having emergency pull stations in every classroom that automatically calls the police & sets of an alarm to alert everyone in the building. There have also been some absurd suggestions, like having every kindergarten teacher come to class with a loaded gun every day. The real question is do we spend the money to fully secure the building against a crazed armed gunman. My answer is no. It is simply not practical. A crazed gunman can simply shoot a guard and shoot glass to get in. To really secure a building you would need multiple highly trained armed guards. Even with emotions running high we must think rationally. Can we really protect ourselves 100% against every potential danger? Sometimes it's just up to the man upstairs. There's been some criticism about schools charging a "security fee" along with other junk fees. Personally I think it's good that this cost is broken out separately from tuition and other expenses. I think parents are more willing to pay extra if they know the money is being used to keep their kids safe. If it's just built into regular tuition parents might assume the money is going towards superfluous administration, assistant teachers or extra-curricular programs. Does He'atid High Already Exist? I didn't realize it when I wrote my last post but apparently there is a low cost Yeshiva High School that is already in operation in New Jersey. It's called the Pre-Collegiate Learning Center and it's in East Brunswick, NJ. And when I say low-cost, I mean LOW COST. $5,000 per student!! Or check out their website. Or like them on Facebook. Or read about them in the Jewish Week. Or attend the next parlor meeting, this coming Tuesday, December 18 in Highland Park, NJ at 7PM. For more info or to RSVP, please contact the office at (732) 387-2693 or send an email to office@pclnj.com. Some of the critics of He'atid argue that younger children don't have the attention span to learn from a computer. I disagree. But I wonder if those critics would have the same problem with a high school that emphasized computer-based learning. I don't really get how computer based learning saves money in early childhood if you still have 2 teachers in the room but in high school there can be periods where you don't need a teacher at all. We need someone that can get this off the ground. Help us GD! At the He'atid parlor meetings we were told about the concept of "flipped classrooms," where lessons would be taught online through pre-recorded lectures & problem solving (or "homework") would be done in class with a teacher present to assist when necessary. The term "flipped classrom" was invented by educational pioneer Salman Khan as part of his "Khan Academy." Khan seems to imply that the purpose is to individualize the educational experience & let students learn at their own pace, but He'atid seemed to imply that it was a cost-saving measure. I'm not clear how it saves money since you still need a teacher for the same amount of hours. Perhaps it would reduce resource room needs if the teacher was helping students with the exercises. But even if it doesn't save money it certainly would help the parents if they didn't have to sit with the kids while they are doing homework. Students in Mrs. Koslowe's 6th Grade math classes tookpart this week in a "Flipped Classroom" experiment, while leaning about Exponents. In a Flipped Classroom, learning takes place primarily online and most class time is used to practice and reinforce concepts. The teacher moves from his/her role in the traditional classroom of "Sage on the Stage" to a new role of "Guide on the Side" Mrs. Koslowe's students watched the online Video Tutors that work in conjunction with our Pearson Math textbooks and began practicing at home by taking the 5 question online quiz on the topic of Exponents and Simplifying Expressions that contain exponents. Quizzes are scored by the computer and can be retaken, with similar questions of the same genre, until a perfect score is achieved. A link to Pearson's web page is accessed through Mrs. Koslowe's homepage on HAIKU, our new homework and learning management program. You can now send your children to nursery in Westchester for the bargain basement price of $13,500. The LWMO YDS Westchester Day School in Mamaroneck is less than 1/2 hr from the GW bridge (without traffic) according to Google Maps. I put up a link on the right to their tuition schedule. Before you laugh at how outrageous the fees are, keep in mind that they don't have the same "junk fees" so popular in New Jersey. With the reduction they just announced they are in the same ballpark as our "legacies"
I can only suspect that they are lowering it to compete with the forthcoming New Roc Torah Academy the same way BC legacies lowered to compete with He'atid. The text of the letter to the parents can be seen after the Jump. We are delighted to open registration for the 2013-2014 academic year at Yeshivat He’Atid. "Charter schools are a fact of life," said Trustee David Diuguid. "We should focus our energy not in attempting to block them, but in making sure that those that come here come for a worthwhile reason." Residents should have a voice about which charter schools come to their communities, Diuguid said. The quest for funding and the demise of charter schools continues to be espoused by many within the NJ hierarchy without adequate regard to efficient and effective spending. Board of Education Vice President Gervonn Rice said she hoped to lobby the governor about reforming charter school legislation to allow voters in local districts to weigh in on the creation of charter schools and to ensure they are held to the same standards as traditional public schools. “It should be the same level of accountability,” she said. • We are not against charter schools. • We are not against virtual learning. • We are not against virtual charter schools. • We ARE against the present statutes and regulations that allow a virtual charter school application to threaten the very existence of the Teaneck public school system. Therefore, we demand a moratorium on all virtual charter school applications until the laws are changed to protect Teaneck’s and all New Jersey public schools. Teaneck Patch reports below on the appeal by the infamous Hebrew language charter school that already had two failed attempts at opening. I really wish they would step aside and let someone else try to open a Hebrew charter school in the area. I doubt anyone would trust them again at this point. Federal grant money on hold for proposed Hebrew-immersion school, official says. Proposed Hebrew immersion charter school Shalom Academy has appealed a state decision to block the school from opening, officials said Tuesday. State Education Commissioner Chris Cerf in July rejected the school’s bid to open in Teaneck, saying the school had not proven it was ready and could not supply the required documents. Cerf’s decision came after the school was granted a planning year to secure a location. A spokeswoman at the U.S. Department of Education, which awarded Shalom Academy a $200,000 grant last year, confirmed the school had filed an appeal. Federal grant money is frozen during the process. “The school is appealing its denial. They did not receive continuation funding so their grants will remain open but on hold through the appeals process,” the spokeswoman said. Shalom Academy founder Raphael Bachrach did not respond to a message seeking comment. The charter school was planned to serve students in Teaneck and Englewood. Both districts opposed the application, raising concerns over the program and budget impact. Shalom Academy planned to enroll 160 students. The school filled those spots and some grades had waiting lists, a representative told Patch in June. Teaneck and Englewood were required to allocate funds for students from each community to attend the K-5 school. The Teaneck Board of Education allocated $1.4 million for Shalom Academy as part of the 2012-2013 budget while Englewood had set aside around $785,000. I cover education for The New York Jewish Week and am working on an article about Yeshivat He'Atid and some of the other new Jewish schools (already launched and in planning stages) that are following He'atid's "blended learning" and lower-cost approach. I'll be visiting the school next week and meeting with teachers, administrators and lay leaders, but I'd also like to interview parents who have children in the school. I'm particularly interested to learn how happy (or not) parents are so far, how the school compares with other Jewish schools where they have enrolled children, and what concerns they have. If you are interested in being interviewed by phone, please e-mail me at julie.inthemix@gmail.com. I can protect confidentiality if necessary (although I prefer on-the-record, for-attribution interviews) but I do need to know your name so I can confirm you are a real person. Anyone reading Jewish newspapers like the Jewish Week, Jewish Press or Jewish Standard has seen a flood of expensive advertisements put in by the local schools to attract people to their upcoming open houses. 2 weeks ago the Jewish Standard had an ad like the one above that had all of the open houses listed together in one ad. I thought it was a great idea that the schools would consolidate their advertising costs to save money, similar to the way I suggested back in December in a post title Marketing Expenses. Unfortunately when I turned the page there was a half-page color ad for Moriah. The next page had a half-page ad for BPY. So instead of the combined ad replacing the individual ads they are now in addition to them, with the costs born by Jewish Federation donors and, as always, the tuition payers. Will the schools ever change their ways? Is their competition with one another more important than working together for the good of the community? The Board of Education Candidates Forum sponsored by the League of Women Voters and Teaneck PTO Council is scheduled for Monday, October 15 at Teaneck High School (3rd floor Student Center). The Forum will begin at 7:30. Candidates for three year terms include two incumbents (David Deguid, Gervonn Rice); Sara Rapaport, co-founder of Teaneck 2020; and David Gruber, author of the Teaneck Causes blog and a member of Congregation Netivot Shalom. Your attendance is critical to raise the interests of the community. 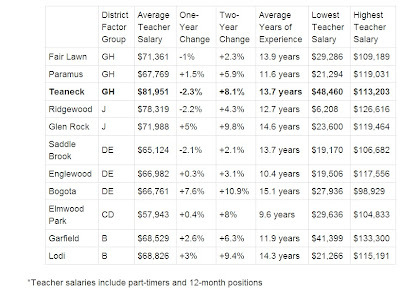 Chart above comes from a Teaneck Patch article showing Teaneck with the highest paid teachers in Bergen County. 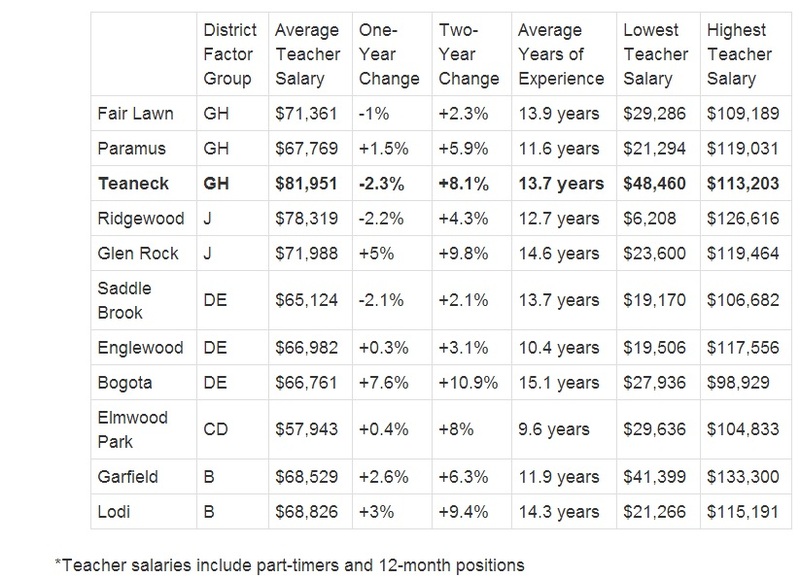 I'm curious to know how the salaries compare to Yeshiva Day School teacher salaries so we can know if there really is a chance teachers would bolt to public schools if we added days to the calendar, as one reader suggested. Of course there are huge advantages for MO teachers to want to stay in an MO school including being off for Yom Tov, discounts if they send their children to the school (or at least getting to pay in pre-tax dollars), familiarity with the environment, kosher food, etc. • Pre-kindergarten: 18 students with a teacher and a paraprofessional. • Grades 1-6: 32 students. • Junior high school/middle school: 33 students in non-Title I schools; 30 in Title I schools. • High school: 34 students; 50 in physical education/gym. Right now the only YDS in BC open on Chol Hamoed Succot is BPY. They are planning activities for the children that don't involve writing. Word on the street is that Yavneh will be open next year as well. They should ALL be open. Principals will claim that halacha forbids writing on Chol Hamoed unless it is truly necessary or it is done "kili'achar yad" (in a backhanded fashion). Some schools in the past have told children to write with their left hands (or right hands if they are lefties) or to write with crayons, or something else that they don't normally use. Here's the reality though. Instead of writing a few hundred words in school kids will be texting a few thousand words from home, which is arguably just as bad. And the parents will mostly be working, whether it is truly necessary or not (except those who can't work because their kids are off or they work for Jewish institutions). I'm pretty sure the poll to the right will confirm that. I can't help thinking the halachic argument is an excuse for teachers & admins to take a week off while the rest of us work to pay their salaries. If we truly need to take this week off then it should be made up for on other days so that we can have the same number of school days as the public schools, who themselves have too few when compared to other countries. In order to accommodate all of our parent body, as well as be sensitive to financial pressures within the community, we are pleased to inform you that we will be lowering the tuition for our Buds and Kindergarten programs, for the 2013-2014 school year. We are so appreciative to all of you who have contributed generously this past year with time and financial resources, enabling us to lower ALL tuitions this current year. Through a continued focus on budgeting and cash management, coupled with a record annual campaign, we are able to pass along this savings to our parent body, while maintaining our commitment to low student-teacher ratios and academic excellence. We are pleased to inform you that the Buds tuition will be lowered while continuing to deliver excellence and innovation with the same low student - teacher ratio. The new revised tuition rate for each Buds student for 2013-2014 will be $8,950 plus $850 registration, totaling $9,800. In addition, the extended Buds hours (8:30am-3:00pm) that began this year will continue as a permanent change to the program. In past years, some Yeshivat Noam families have elected to enroll their children in one of the less expensive local Pre-K options that are available. For this current school year of 2012-2013, we were able to fill our stellar Buds program with our current pricing. With our new reduced tuition rates and extended hours, we expect an even greater demand for our program. Therefore, we want to stress to all of our existing Yeshivat Noam parents that we will be unable to guarantee your child's spot in Kindergarten unless you enroll your eligible child in Buds for the 2013-2014 academic year. Of course, all siblings of existing Yeshivat Noam families currently have a reserved spot in our Buds program. However, families who choose not to confirm that reservation by enrolling their children in Buds risk losing a seat for their child in Kindergarten and beyond, if that spot is filled by a new incoming family. We are pleased to inform you that the Kindergarten tuition will be reduced by $1,050 per student, while continuing to deliver excellence and innovation with the same low student - teacher ratio. The new revised tuition rate for each Kindergarten student will be $12,950 plus the $850 registration fee. Recognizing the needs of working parents for whom affordable pre-care and after-care programs are vital, Yeshivat Noam offers a non-academic and less expensive pre- and post-care option. Pre-care is available from 8:00 am and post-care is available until 4:30 pm. We know that September 2013 may seem like a long time away, but if you plan to enroll your child in Buds next year, please click on the Buds sibling application, fill it out and return it to the office by October 17th. Similarly, if you have a sibling who you plan to enroll in Yeshivat Noam for Kindergarten or Grades 1-8, please click on the Kindergarten sibling application or the Grades 1-8 sibling application, fill it out and return it to the school office by October 17th. If you have any questions, please feel free to contact our Executive Director, Enid Anziska at 201-261-1919, ext. 124. Back in January we had a guest post about an after-school Talmud Torah program that was planned to open this fall somewhere in Bergen County. It was to serve the needs of students who attended public schools but wanted to get a Jewish studies education. Unfortunately it did not open this year & no decision has yet been made about the future. I still think that if a Hebrew charter school can ever get off the ground then a combined program with the Talmud Torah could be a good, relatively inexpensive alternative to the Day School system for some parents. Gnar Chatima Tova to all! He'atid had Back-to-School night last night & it seemed as though everything was running smoothly. The teachers & parents both had mostly positive attitudes. 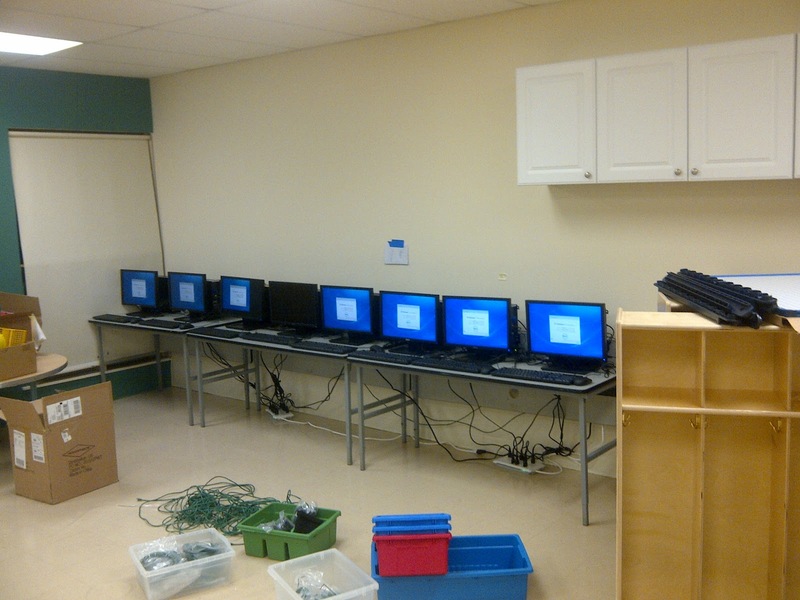 The classrooms were clean & decked out with brand new furniture built as a labor of love by parent volunteers. It's a shame that the brand new computers are still sitting there practically untouched but I'm sure that will change after the chagim. Privately I heard that the school is on the projected budget, even though they are operating at a deficit the first year as expected. Anyone there last night have any thoughts? Check out the email below from Yavneh. Looks like they may actually start BEFORE Labor Day next year. I'm sure some teachers will whine but consider that in Israel they started school on August 27th. If we are going to have so many days off for the Tishrei chagim, is it so crazy that we need to start before the public schools that, at most, have only 3 days off for Jewish holidays? Now that school is in full swing, I want to draw our attention to the start of school for September 2013. Precisely one year from today, the Thursday after Labor Day, we will be celebrating the first day of Rosh Hashana. Essentially that leaves but one day of school next year between Labor Day and Rosh Hashana. Past practice has been that Yavneh has started school prior to Labor Day when the calendar presents similar scenarios. While we have not yet convened to formally construct next year’s academic calendar, I want to publicize the strong likelihood that school will start before Labor Day next year. The goal of sharing this email with you now is to avoid any potential end of summer conflicts. Let us turn our attention to all the school days remaining for a wonderful 2012-2103/5773 school year! Jake Goldstein wrote an op-ed in the Jewish Press suggesting that parents who are on financial assistance be asked nicely every year to donate to the school even after their children graduate, to compensate the school for the tuition assistance that they received. As he admits, parents struggling to pay for elementary school education are going to have an even harder time paying for high school, college, weddings, etc. so most of them wont have much disposable income left over for donations. However for the few whose fortunes turn around and they suddenly have money available for donations, their first priority for donations should be the schools that helped them out when they couldn't pay full freight. So his suggestion, while not a "solution", should still be pursued. It only costs a few stamps every year & if it helps get one parent to repay a few thousand dollars, it's worth it. 1. A new clause should be included in the tuition reduction form which parents would agree to in writing accepting a moral commitment to make a sincere and good faith ‘best efforts’ to pay back as much of the accumulated tuition reduction as possible by making the school a top priority recipient of their discretionary charitable donations, now and upon leaving the school. 2. Accumulated tuition reduction would then be tracked throughout the duration of the parents’ tenure at the school. 3. On every Elul thereafter, including after their youngest child graduates, parents would receive a statement reminder quantifying the accumulated tuition assistance they received and the years in which it was received, along with the accumulated donations they have given toward their moral obligation. Jewish Week Covers "Tuition Crisis"
Kudos to the team of volunteers staying up late last night assembling tables and the many computers to prepare for the big opening on September 4th. Admins were there working hard as well. Even Rabbi Gralla was busy vacuuming! This "sweat equity" will help defray costs. It was the model for the "cooperative yeshiva" they tried to start in West Orange last year. I encourage everyone to come Monday night to finish up. Even if you don't have kids going there its a fun way to help a local Yeshiva and to work on the tuition crisis in a small way, but in a way more useful than kvetching.